Well, ok, it’s a documentary/interview, not a Hollywood biopic. Blandine Armand is a French documentary maker whose primary area of interest is the process of artistic creation, and who has made a number of documentaries about film directors for Arte. 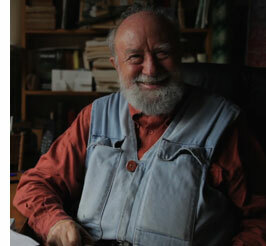 Her portrait of Michel Butor was broadcast recently on France 5. Telerama’s review (see attached) says that Butor ‘continues to develop an oeuvre that is lively and erudite, including prose, poetry, essays and collaborations with visual artists. Intelligence, passion, simplicity and goodwill radiate from this delightful man, to whom this portrait does full justice’. I will provide details of availability on DVD as soon as I’ve tracked it down. This entry was posted on March 28, 2012, 10:24 pm and is filed under Michel Butor. You can follow any responses to this entry through RSS 2.0. You can leave a response, or trackback from your own site.